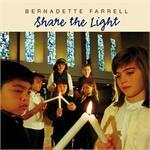 Bernadette Farrell is one of Britain's leading liturgical composers of Catholic music, a former member of the St. Thomas More Group in London, and an acclaimed pastoral musician. She is most famous for her bestselling title-song Christ Be Our Light CD. People the world over also love the songs Everyday God and Unless a Grain of Wheat, both of which can be found on the Restless Is The Heart CD. Another favorite is the God Beyond All Names CD. Bernadette's latest work is the Go Before Us CD. Includes: Peace Child, My Soul Is Thirsting, Come To The Well, and Go Before Us. Includes: Jesus Lamb of God, God Has Chosen Me, and God Beyond All Names. Includes: Everyday God, Unless A Grain of Wheat, and Restless Is The Heart. Includes: Magnificat, Let Nothing Trouble You, Jesus Lamb of God, and Christ Be Our Light.